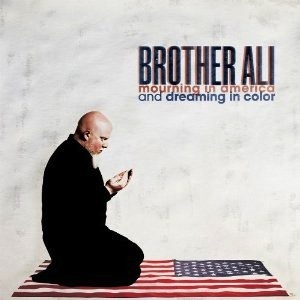 Brother Ali‘s fifth offering, Mourning in America and Dreaming in Color, is ostensibly about the state of disunion, but that doesn’t mean preachy political diatribes. The strongest moments find the Minnesota rapper elucidating daily routines, from the option-deficient working poor (“Only Life I Know”) to lucky and unhappy entertainers (“Won More Hit”). Don’t expect revelatory proclamations; his words are more thoughtful than thought-provoking. Ali’s power lies in his delivery, equal parts ego and empathy. “I Need a Knot” (featuring the perpetually slept-on Bun B) cleverly disguises honest struggles in extended metaphors for illicit activities. An abundance of four-syllable forced rhymes and an increasingly infuriated cadence bless the final verse of “Fajr.” Even on compulsory braggadocio such as “Say Amen,” the flow wins us over. Jake One‘s consistency holds the project together, channeling disparate styles of his past collaborators. “The Grind Date” era De La Soul-drenched beats (“Only Life I Know,” “Work Everyday”) fit best with the rhymes, even though the vocal sample on “All You Need” occasionally drowns Ali out. “Won More Hit” sprinkles video game noises over G-Unit-like cheesy/spooky tones. Brother Ali isn’t about to become as ubiquitous as Rick Ross, but his act benefits immensely from production polish.